This lesson looks at an American rumba rhythm pattern. 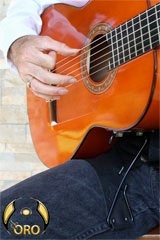 The DE ORO “FlamencoLoco” specialty guitar support. Black frame & black leather strap.